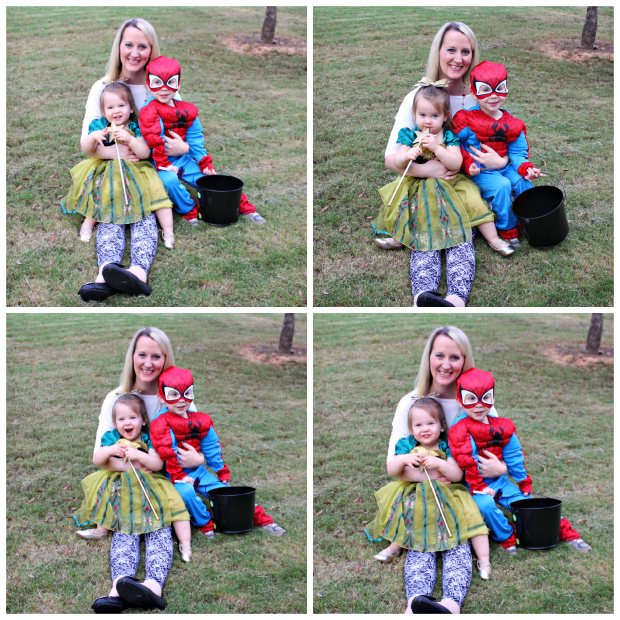 We had the best Halloween weekend! I kicked it off by dressing up for work on Friday. They’ve never let us do that in my eleven years here, but they surprised us Thursday morning by telling us that we could dress up, and y’all know that I was all over that! Since they didn’t give us very much notice, I had to run out at lunch and grab whatever I could find as my costumes from Halloweens past are not remotely appropriate for corporate America. Since I love leopard so much, I decided to get some leopard ears, throw on a leopard scarf and leopard shoes (along with some fabulous gold leggings that I’ve just been dying to wear) and call it a day. Friday evening we took the kids out for Mex to kick off the weekend and lawd was that a mistake! Olivia has a tooth coming in so she’s been cranky, and little girlfriend was hollering as loud as she could about every little thing while Jacob kept saying over and over, “I don’t want to eat here. This place is yucky.” There wasn’t enough tequila in my margarita to get through that chaos, so we choked down our food and hightailed it outta there faster than Olivia could throw her taco on the floor. 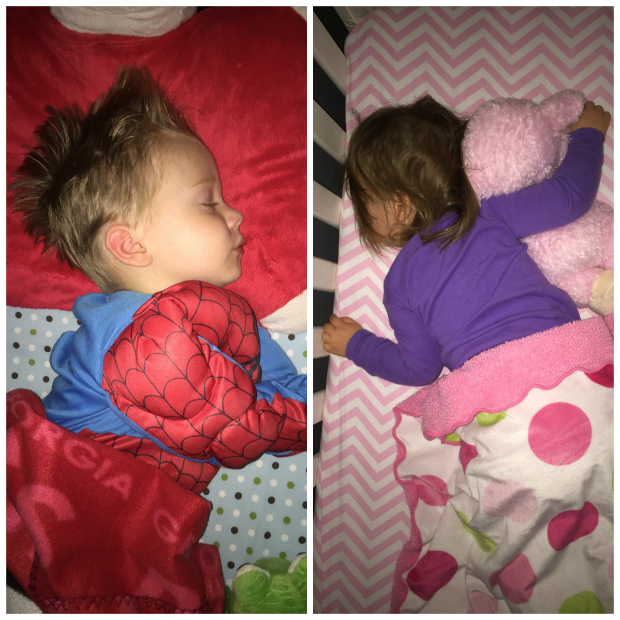 They do look really sweet when they sleep, though. 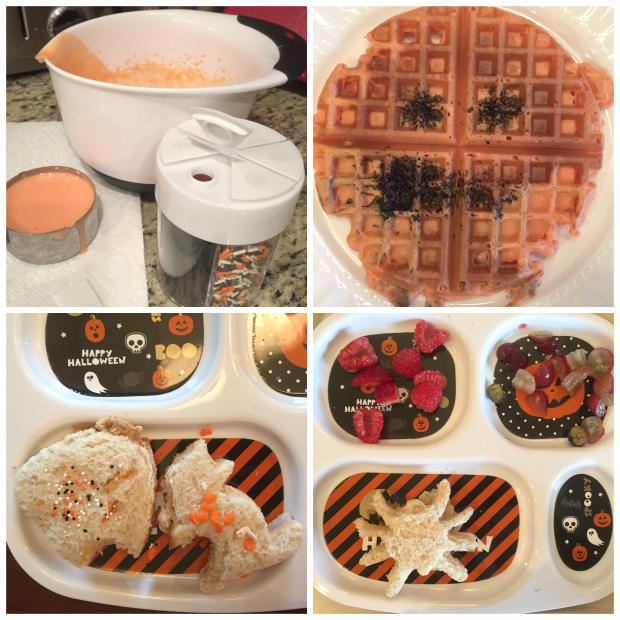 Saturday we had pumpkin face waffles for breakfast, and spider, candy corn, and black cat shaped sandwiches on Halloween plates for lunch. Very festive. Have I mentioned that I love having kids?! As you all saw in my post from this past week, Georgia played Florida this weekend, and for those of you who were wondering… we decided to go ahead and put Jacob in the onesie. It buttoned and everything! It proved to be verrrry bad luck, though, so we ripped that puppy off at halftime. However, it was too little too late, and we lost. Badly. So the onesie is officially retired at 3 and 2. At least it’s still a winning onesie overall. 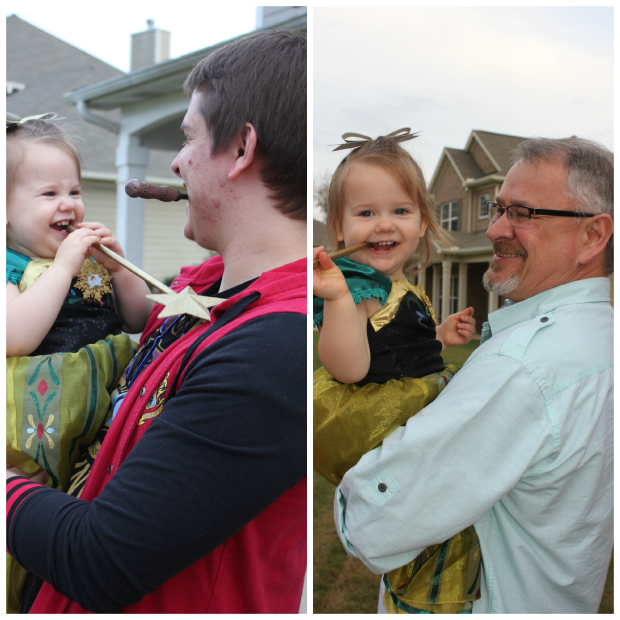 My parents and Brian’s dad all came over for pizza around 5, and then it was time to head out for trick or treating. Jacob and Olivia loved every single second of it! This was the first year that Jacob was really into it, and he kept saying, “Can we go to another house?” Olivia was super into it, too, and she shouted, “TWEEEEAT!” every time someone would open the door. And she didn’t want to be carried down the street or anything. She walked right along with all her might the entire time trying to keep up with Jacob. She even carried her own bucket the entire time. She had some trouble stepping off of the curbs, so she would hold out her little hand and very politely say, “Hand?” to Jacob (and only Jacob – she did not want anyone else to help her) and he would grab her hand and help her down like a true southern gentleman. We went to all of the houses on our street plus one on the street at the end of ours, and then we went back to our house to help my parents hand out candy. The kiddos plopped down in the grass to look at all of their loot, and we let both of them chow down on Kit Kats and lollipops. 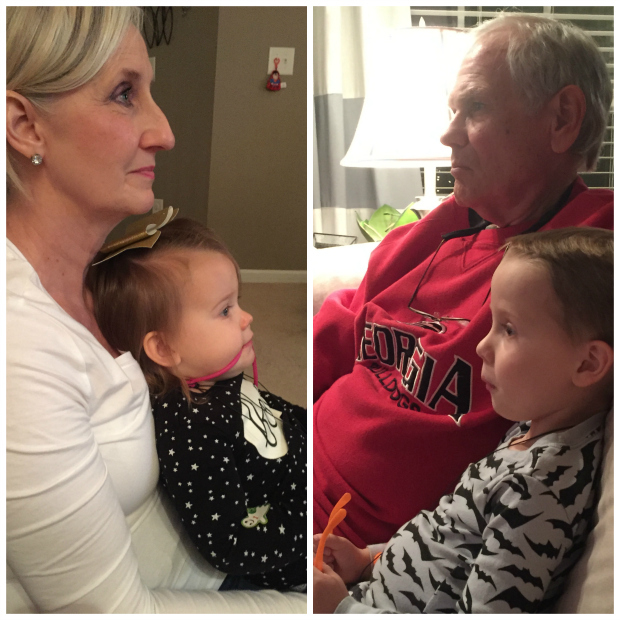 Around 8 we went inside, got the kids changed into their Halloween PJs, and we settled in with all of the grandparents to watch It’s the Great Pumpkin, Charlie Brown… one of my favorite traditions. The kids were wiped after the movie, so they both fell right to sleep despite the fact that they had just loaded up on sugar an hour or so prior. Sunday morning we got to sleep in until 8:30 (the old time, but still fantastic), which was quite a treat, and we awoke to pouring rain. We sorted the kids’ candy and they played with their Halloween stickers and silly-eyed glasses that the grandparents had given them, watched a little TV, and did a little crafting for Jacob’s school project. We had Jason’s Deli for lunch, and then afterward, the rain had slowed down to a light mist, so we took the kids downtown to the railroad tracks and let them splash in puddles and crunch on some fall leaves in their beloved rain boots. They. Had. A. Blast. Because – boots. Olivia kept needing help walking down the railroad tracks, so she did the same thing as the previous night... she would hold out her hand, look at Jacob, and say, "Hand?" very sweetly. He would then grab her hand and walk with her. Seriously the sweetest. Naptime was extra long which was nice, so I was able to hole up in my office, turn on some Christmas tunes, and get some more picture sorting done. It was the perfect way to spend the rainy afternoon. We ended the weekend at my parents’ house for dinner, and my mom made one of my favorite dishes – Chicken and Sundried Tomatoes over Linguini, Italian inspired squash, and garlic green beans. It was divine. We opened a bottle of wine, turned on some more Christmas tunes there (my Momma’s a fanatic like I am! ), and had a very cozy evening with the fam and my Grandma (my dad’s stepmother). My Mama Cass (my Momma’s mother that usually comes every Sunday now) couldn’t make it this week, and we missed her greatly! Let the most wonderful time of the year begin! FALALALALALALALALA!!!! Oh my gosh what a FANTASTIC weekend you had!!! Seriously, so much fun! Seriously loved looking at your fam's photos!! And giiirl I am right there with you-my Michael Buble Christmas station on pandora has finally made its appearance! Christmas music 24-7 for the next 2 months-yes!!! Aw yay this made me smile! I'm like you about Christmas and Christmas music...like the little girl from Prancer! Also, the photos you got of the kids playing are awesome. The Halloween costumes and weekend in general looked perfect, and your work costume was adorable (and on short notice...go you!)! Oh my goodness, your little ones holding hands is just so sweet. So glad it was a happy Halloween!! Seriously your weekend was perfect!!! Love that you got to dress up at work, so fun! 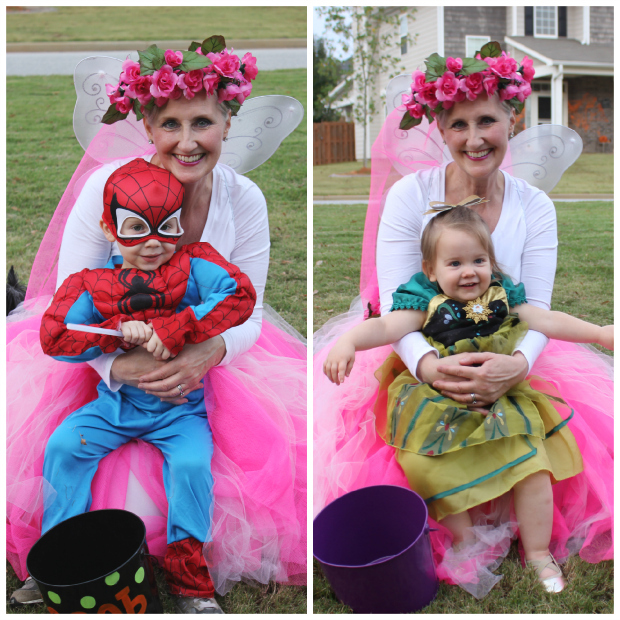 Love your festive food on Halloween and love the kids in their costumes!! And is it just me, or did Olivia seem to grow a mile lately!? She looks so big all of the sudden! Yes, I was so excited that they let us dress up at work... there's a first time for everything, I suppose! And yes, Olivia has just not stopped growing!! Around this time was when Jacob finally started slowing down (or pretty much stopped growing since he's so small now - LOL) but she just keeps on growing and growing! She's gonna pass him if she doesn't slow down! Haha. Love your Halloween meals - so cute! At least you got in a few sips of that margarita too! The kids look great in their Halloween costumes. 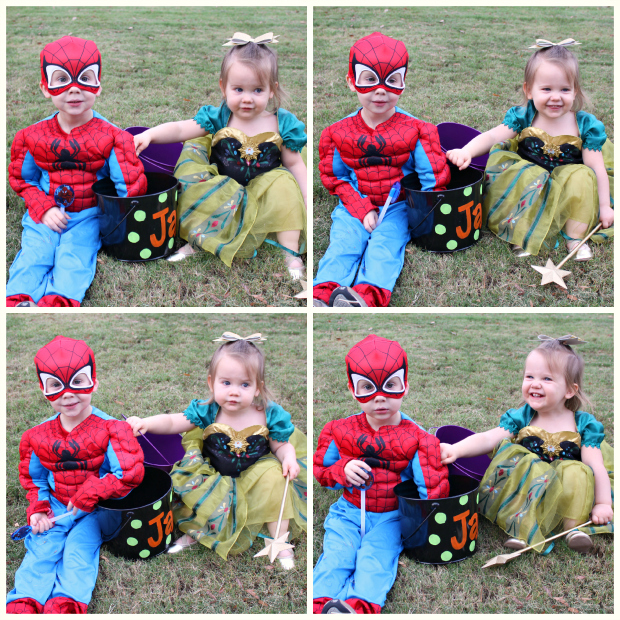 The kids looked so cute in their costumes! I'm so glad you had a great weekend! How sweet of Jacob to give his hand to Olivia. You sure are raising a perfect gentleman. Olivia's costume is so cute and that gold bow...perfection! I seriously love it and kind of want one for me! You guys always way the yummiest things on the weekend! Yum! Thanks, Marie! Yes, it melts my heart when they are sweet to each other like that because they sure do fuss and fight most of the time! Haha.